Iris hexagona is the oldest recognized species in the Louisiana iris group (Hexagonae), having been named by Walter in 1788 based upon specimens found in South Carolina. Like other irises in the Louisiana series, I. hexagona inhabits wet spots. It is found in ditches, swamps and shallow slow moving streams in either full sun or half shade. 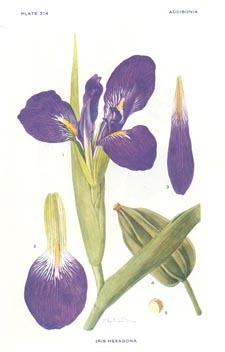 Despite its early designation, the range and composition of I. hexagona may be the most confused and uncertain of all the species in the Louisiana iris series. I. hexagona is the current designation for not just South Carolina irises of the Hexagonae but for all those found in Florida. At one time, I. hexagona was thought to occur in Louisiana as well, but today irises there that were once considered to be hexagona are regarded as variants of the giant blue Iris giganticaerulea. Some do feel that all of the predominantly blue irises (including giganticaerulea but probably not the short I. brevicaulis) ought to be considered variations of I. hexagona rather than as separate species. That is not the most widely accepted view, however. While the hexagona vs. giganticaerulea question smolders, a more burning issue is whether I. hexagona is an appropriate designation for all of the "Louisiana" irises that grow widely in wet areas of Florida. 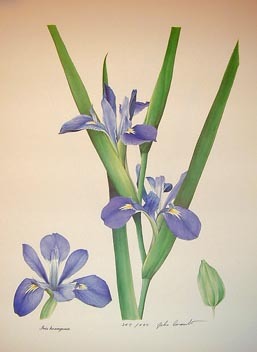 Irises of the hexagonae series are not at all widespread in South Carolina where the classification was born and where they apparently are limited to three counties. In Florida, on the other hand and in the words of Dr. John K. Small writing in Addisonia prior to 1930 about one particular Florida form: "The colonies are usually to be measured by the acres, often in extent further than the eye can reach..."
Beyond the sheer volume of plants among the under appreciated Florida irises, there are significant differences reported in form, color, and bloom season. And, many irises found in Florida appear noticeably different when compared to I. hexagona specimens from South Carolina, which might be considered the benchmark for the species. All the pictures on this page are of South Carolina plants or plants of a similar form. Contrast these to the range of flower forms found in Florida. The final word on species will be uttered by scientists and taxonomists, not by gardeners and hobbyists. But the scientists need to get busy. Taxonomy should help us understand the world, but more is going on among Florida irises than is explained by lumping them into a single, undifferentiated category as is the case today. There are dissenting voices as will be evident from the Florida page and from following links below to the web sites of various authorities. Work is needed to resolve contradictory views and clarify or explain discrepancies apparent to close observers. I. hexagona plate in Addisonia, a publication of the New York Botanical Garden, ca 1929. USDA Plant Profile with a map feature that shows location by county. This source lumps I. hexagona with I. giganticaerulea, but the county distribution maps are interesting for particular states. 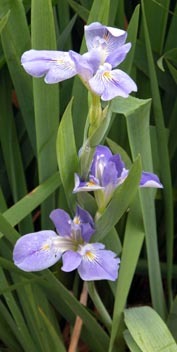 Google Image Search for Iris hexagona. Go to Google Images and type in "Iris hexagona". This search turns up interesting pictures and sources that are not found by other searches. There also are some cases of mistaken identity. After a few pages of listings, the results are often off-topic. Audubon blog. A nice picture and commentary from Florida. Shows a deeper blue-purple color than is found in I. giganticaerulea or I. brevicaulis.